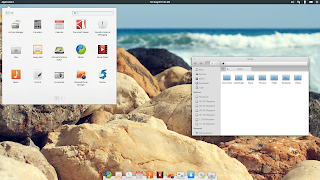 Two years after the "Jupiter" release, elementary OS 0.2 Luna (stable) has been made available for download recently. With a bit of a delay, here's a quick overview of what to expect from Luna, along with screenshots and of course, a video. Based on Ubuntu 12.04 LTS, which will be supported until April 2017, elementary OS Luna ships with its own shell called Pantheon and applications that respect the elementary OS philosophy: beautiful, fast and minimalistic. You can see these in action in the video at the bottom of this article. As for the artwork, Daniel Fore's beautiful GTK and icon themes are of course used by default. Through the Luna development, both have received various improvements: for instance, Luna uses new folder icons and the GTK theme has received new switches, infobars, spin buttons and much more. You can see these changes throughout the screenshots in this article. elementary OS 0.2 Luna is truly special: the beautiful indicators, the smart dock, the lightweight default applications of which most are especially designed for elementary OS and the classy effects fit really well together and offer a clean, consistent desktop. And all of this, on top of Ubuntu 12.04 LTS which means you have access to all the applications available for Ubuntu and the long term support (supported until April 2017). However, since besides the default applications there are very few apps that follow the elementary OS design guidelines, this consistency can easily be broken by simply installing a few extra applications and this takes away some of elementary's charm. Another issue, some would say, is the lack of various options / customizations for some of the default elementary OS applications. The main reason behind this is that the elementary team tries to provide a good set of defaults so you don't have to tweak anything yourself. Other applications included by default in elementary OS are Maya (calendar), Scratch (text editor), Pantheon Terminal, Midori (web browser), Empathy, Totem, Simple Scan, Shotwell and of course, Ubuntu Software Center. You can also purchase physical elementary OS Luna CDs (as well as branded t-shirts and stickers) from the elementary store.